Welcome to Great Oyster Bay, home to some of the juiciest and most delicious seafood in Australia. 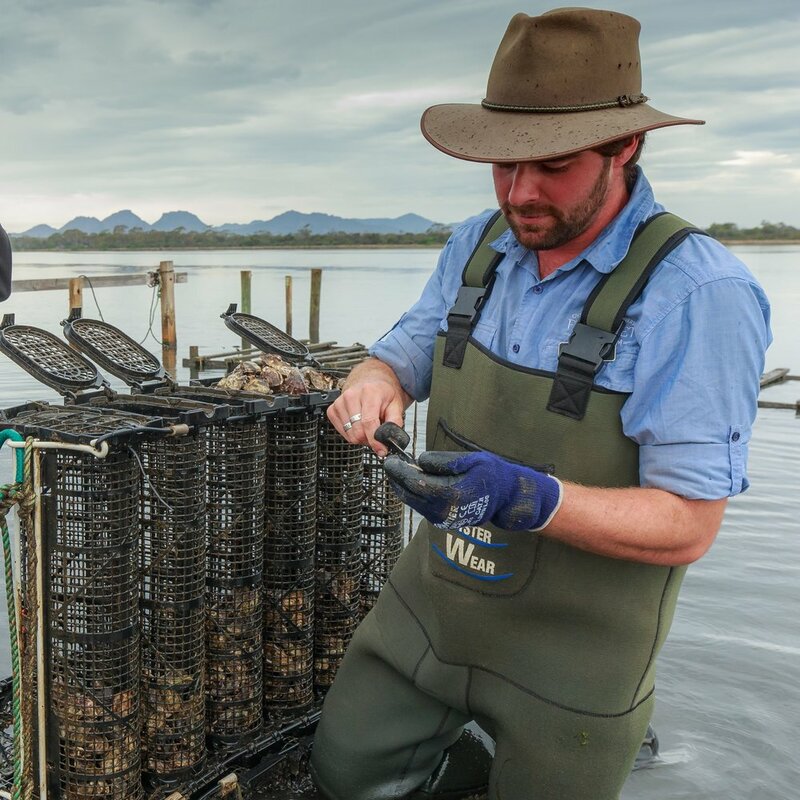 Located on Freycinet peninsula, along the spectacular Great Eastern Drive, our pristine waters, fresh air and the abundance of sea life make for perfect oyster farming conditions. Our head guide Declan is a real deal oyster farmer down at Freycinet Marine Farm, working along side the wonderful Giles & Julia Fisher to produce high quality pacific oysters and mussels, delivered straight from the farm to the shop. 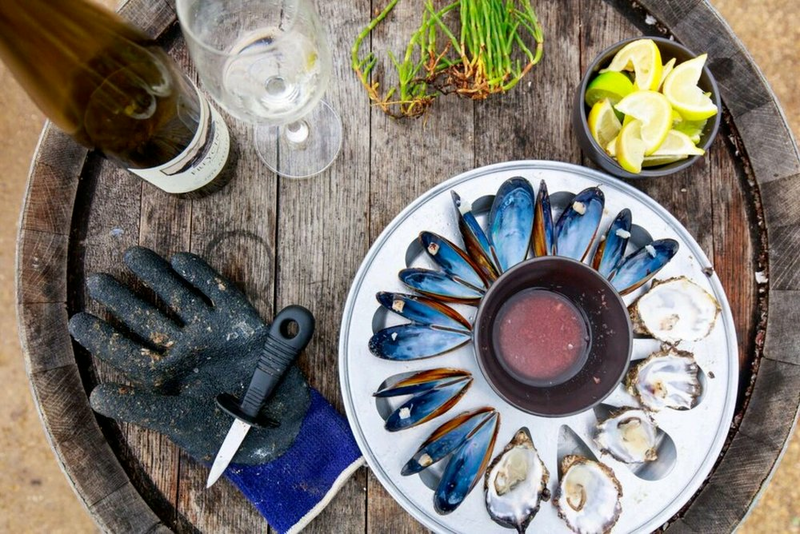 Tours start at $95 per person and include a 2 hour return tour of the oyster farm, wader hire, a shucking lesson, 6 natural pacific oysters with matching dressings, half a bowl of steamed mussels and a glass of delicious Freycinet Vineyard riesling. This is an all weather tour. Unless it rains you should not get wet. Please dress appropriately for the weather conditions. We recommend you wear or bring a pair of socks and shorts/pants for comfort in our waders/overalls. No special shoes required. If you want to bring a child on tour please see our terms & conditions. To secure a reservation it is essential to book and pay for your tour. Last minute bookings are welcome over the phone but are subject to availability. For large group bookings >10 people please email us via the contact form. Want to book a tour? You can select your tour date/time and book online today. Book a tour for up to 10 people. 1) Due to seating you will need to follow the tour bus and drive your own vehicle down the dirt service road to the farm (15 minute drive). No special vehicle required. 2) One guardian will need to stay on land and take full responsibility for the children throughout the water based part of the tour. However we suggest that if there are 2 adults that they both put on waders and swap over half way as the water section (taking up approximately 45 minutes of the tour) is not far off shore (approximately 20 metres). 3) Adults will pay a full fee of $95/person. Children under 12 are free of charge. In the case your child enjoys seafood we have the option to purchase additional oysters and mussels at shop price so that they can join in the tasting part of the tour. The easiest way to book would be online for the adults and advise us on the registration form of how many children will be attending. You can also email us to place an order for additional sea food for the children (E.g 1 bowl mussels and 6 oysters) and we can inform you of the price. You can pay for the kids food on the day. We have a portable Eftpos machine or you can pay cash. We have a look and learn treasure map for the children to enjoy while they wait. Oyster Bay Tours has a strict cancellation and refund policy. This tour operates with a minimum of two participants. Single bookings will be offered a full refund or the option to reschedule the tour date and time. Cancellations within 7 days of the original tour date will receive a 50% refund. Tour cancellations less than 7 days prior to the tour date will receive no refund without exception. We do not provide refunds if you are unable to attend due to an unforeseen medical/ environmental emergency. In such circumstances your loss may be recoverable under your travel insurance policy. Tours can be rescheduled at no charge via the website for up to 48 hours prior to the tour date. This is an all weather tour. Tours will only be cancelled in the event of extreme weather warnings. Otherwise wet weather gear is recommended for rainy day tours. Oyster Bay Tours operates on the private property of Freycinet Marine Farm. By registering for this tour you agree to follow the instructions and safety requirements set out by your tour guide. All participants will respect the property of Freycinet Marine Farm and remain in the designated tour area. Participants are forbidden to tamper with or operate any of the surrounding farm machinery. This is a water based tour that requires participants to wade in tidal waters that can be up to waist height. All participants acknowledge the unlikely, but possible, risk of drowning, and declare that they are fit and able to safely participate in this tour at their own risk. Participants acknowledge that shell fish is a known allergen that can result in anaphylaxis and death in extreme cases. By attending this tour, participants hereby declare that they have no known shell fish allergies and are consuming shell fish at their own risk. To redeem your gift voucher please fill out the form below. The more notice you give us, the more likely it is that we can book you on the tour date and time of your choice. You must book for the full number of people listed on your gift voucher. If the tour is available you will receive a confirmation email of your tour booking. If there are any issues with your request we will notify you via email.